Anthology is a dramatic showcase on every level; to entertain and impress with equal flair whether hosting an intimate dinner party for ten to 500 person corporate celebration. No matter how large the party, our renowned chefs meticulously oversee each dish of new American cuisine. 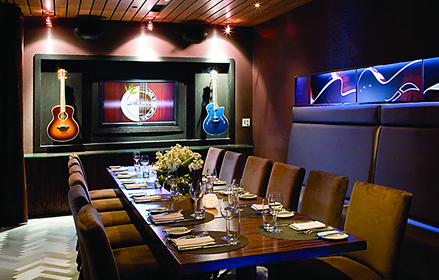 The chic interior boasts cozy spaces for that private concert vibe or impressive, open spaces where the energy of food and music fully engage. The culinary accompaniment: Jazz, Blues, Soul, Latin, and Rock. The senses are engaged, the night memorable and the rumor is:has exquisite taste.